Move your Mac mini off the desktop! 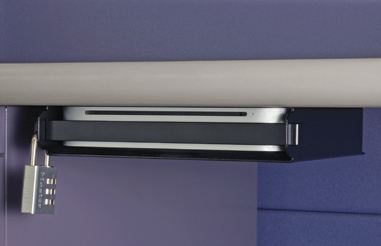 Sonnet's MacCuff™ mini mounting and security systems free up desk space by securing your computer to the back of an LCD display (or mounting it under or on a desk or shelf) while allowing full access to its ports, slots, and power switch. How do you mount a computer to the back of a monitor? VESA mounting holes on the back of many LCD displays provide an ideal spot to attach MacCuff mini. Attached securely on the back of a display, your Mac mini disappears, leaving only cables to hide. To simplify that task, Sonnet supplies a special 35 cm-short monitor cable, and MacCuff mini also provides simple cable management to help cut the clutter. Constructed of rugged steel, MacCuff mini delivers a light touch—its refined double powder-coated finish won't scuff or scratch your Mac mini. The included locking bar provides theft deterrence when used properly. MacCuff mini's design leaves WiFi and Bluetooth antennas uncovered to ensure normal operations, so you don't need to worry about your computer's wireless performance. What about installation? Talk about simple— Sonnet provides the necessary hardware, and easy to follow instructions in case you actually need them. 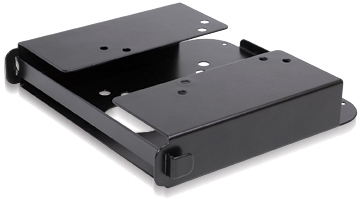 For back-of-monitor mounting, just use the four supplied machine screws to secure MacCuff mini. For under-desk mounting, simply tape the included drill hole guide to the surface, drill pilot holes, and then secure MacCuff mini using the four supplied wood screws. 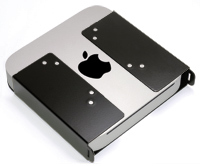 For tabletop mounting, flip MacCuff and Mac mini upside down (Mac mini forced-air cooling and hard drive will function in any orientation). Your Mac mini slides in easily, but is held in place securely. Whether it's secured on the back of your display, or tucked away under your desk or mounted on a table, MacCuff mini brings elegant mounting minimalism to your Mac mini. MacCuff minis feature a rugged steel frame with a refined, durable finish to prevent scratching, and provides a perfect space to place your Mac mini. With VESA mounting screw locations, you can easily install MacCuff mini to VESA-compatible LCD displays to create a sleek and minimal workspace. Or to help eliminate desktop cable clutter, attach MacCuff mini under or on a desk or shelf using the provided drill template and screws. The locking bar included is intended for use as a theft deterrent and will provide added security ONLY when used with a lock. Not compatible with monitors that attach the monitor stand to the monitor using the VESA holes.